First trip of 2018. And first trip in Asia. Chiang Mai and Bangkok. As I write these lines, the memories are still fresh in my mind and heart. Just got back 48 hours ago and I can really say I left a little piece of me behind. Many people come to Thailand in search for certain things. Drinking, partying, escorts. Others come for the beautiful scenery, the amazing beaches, the incredible green or the color of the water. I came to Thailand out of curiosity. And I chose for my first trip in this beautiful country an old, ancient city filled with temples and places of worship and a city renowned for its traffic, its nightlife and its amazing street food. As usual during a new series I will focus on my accommodation in both cities, the food I ate, the places I have seen and maybe an article about the flight, visa process and other small things required for a trip to Thailand. I said above that I came to Thailand out of curiosity. I also came as a result from an Instagram story. On the 19th of December I asked in a story my friends, my followers which city should I visit: Bangkok or Hong Kong? 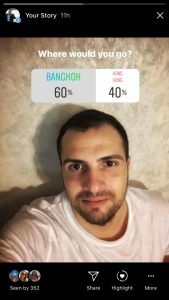 With over 350 votes in after just 11 hours, Bangkok took the lead with a big 60% out of the votes and kept that lead until 24 hours were gone. So I bought the tickets to Chiang Mai and return from Bangkok and looked for accommodation. In Asia I really think Agoda has no rival when it comes to prices so I used this site to book my accommodation for both cities. I stood for a long time and thought if I should cover the distance between the cities by bus or plane and finally decided to book a flight from VietJet Air and I’m really happy with my option. There probably will be a small note on the flight on one of the later emails containing details about price, length, crew, etc. for the people interested in travelling fast from one city to the other. It is hard to say/ to decide what I enjoyed the most in Thailand. Travelling alone I opted for two cities filled with people, temples, palaces because I thought I’d save the trip to the islands for a later date, a date where I will probably be joined by someone. Thailand meant for me a lot of things. It meant amazing buildings, it meant beautiful temples, giant Buddhas, a Grand Palace, rivers, palm trees, great street food, chaotic traffic, floating markets and it meant great people. And when it comes to all of this I can honestly say that I was so impressed by the people here. From the staff at the hotels to the food vendors, from the simple people giving you directions to the people smiling when you look at them Thailand just felt good. From the start, even if I will review them later, I want to thank the people at the two hotels I chose for my trip. They made my trip so much easier, so much fun and pleasant. It is an incredible feeling to be greeted by smiles and joy and laughter on the beginning or at the end of each day, after so many kilometers spent on the road, seeing new things, taking photos while outside the sun was bright and powerful. I certainly will return some day to this country. Maybe even next year since I always wanted to visit 8 islands (yeah, I already know which ones I want) and I’m ready after many years for a more laidback, relaxed trip. I won’t keep this article long on purpose. I want it to be just a small intro for the later articles, articles in which I will detail more of my experiences here. So until my next article in the series, in which I will cover my accommodation in Chiang Mai, I wish you all an amazing week, filled with laughter and joy.